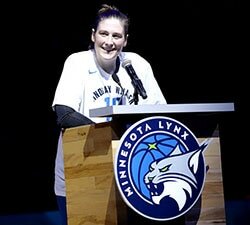 For many players, basketball season doesn’t end once the final buzzer sounds in the WNBA. Here are some of the top recent performers during international play (click here to see the full list of WNBA players overseas). The former Duke Blue Devil and now solid contributor for the Sun, Thomas is really standing out overseas while playing in the Turkish professional league for Orman Genclik Ankara. Through the team’s 11 games this season, Thomas ranks first in points per game (16.0), assists per game (5.0), and steals per game (1.5). 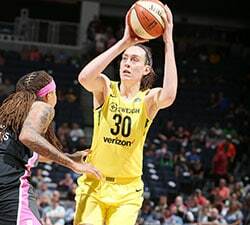 In the WNBA, Thomas is a career 8.8 points per game scorer, but she is coming off her most productive season yet having totaled 14.2 points per game and shot 42.1% from the floor (both career highs). Look for Thomas to continue this groove, and bring the momentum back to the states for this upcoming season. The guard hailing from the University of South Florida made huge strides in her sophomore campaign in the WNBA last season. Taking on a bigger role in the Sun’s offense, Williams tallied 12.3 points per game, shooting a respectable 47.1% from the field. Currently, she is overseas playing in Australia for club team Perth. Now 21 games into the season, and sitting alone at the top of the league at 15-6 overall, Williams is leading her squad with 21.7 points per game, 6.6 rebounds per game, and 3.9 assists per game. This past week was highlighted by a monster double-double of 19 points and 10 rebounds in a tough loss to in-league rival UC Capitals. Indiana’s promising young center is enjoying a great international season in the WKBL in South Korea. Competing for club team Woori Bank, the 6-foot-3 former Notre Dame standout is coming off the most productive week in her international career. In Woori Bank’s last two games, Achonwa notched 19 points and 17 rebounds in a win over Keb Hanabank, and then totaled 18 points and 12 rebounds in the victory over S-Birds. She has been an integral part of the team’s success so far this season, and Woori Bank now finds itself at the top of the standings in the WKBL (15-3). Although Chong appeared in 33 games for the Wings in her rookie season, she didn’t quite make the impact she had hoped for. Having averaged 2.7 points per game while playing 11 minutes per contest, Chong took off to Israel this offseason to regain the confidence that she showed on the court at UConn. So far, Chong has seemingly found her groove again while playing for Elitzur Holon. Through 14 games (10-4), Chong is second on her team in points (19.2 ppg), and tied for the team lead in assists (4.9 apg). In her club’s two recent games, Chong has lit up the stat sheet, averaging 19.5 points, 7.5 rebounds, and 4.5 assists per contest. Clark, a WNBA veteran, is enjoying a very productive overseas season in Poland. Suiting up for CCC Polkowice in the Polish Professional Basketball League, Clark ranks third on her team in points per game (12.6) and first in rebounds per game (6.3). 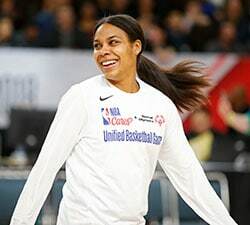 In her team’s last two games, Clark averaged 12 points and eight rebounds, highlighted by a double-double of 14 points and 10 rebounds in a monster win over division foe Enea Azs P. Clark has always figured out how to be productive in the WNBA in her six seasons, so it is no surprise to see her producing solid numbers for her club team in Poland.